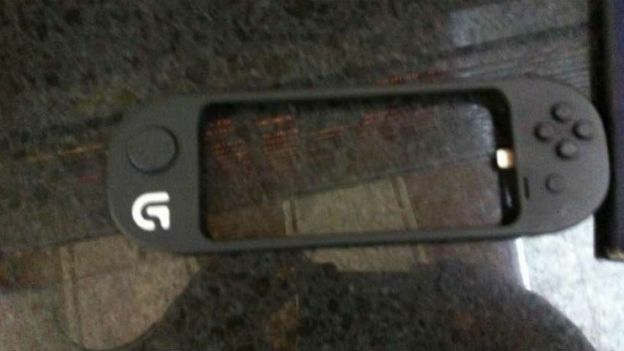 The gamepad, said to be large enough to fit an iPhone 5, has been posted online by Kotaku. Kotaku has posted that they cannot say who gave them the image or where it was seen but that they vouch for the authenticity of the shot. Logitech's gamepad features four buttons on the right, a joystick on the left, and a Lightning port. Apple unveiled iOS 7 last week at their WWDC conference and one feature was the revamped Game Center. This controller and more could be seen as third party developers use the API for 3rd-party MFI game controllers that Apple will be releasing. "Apple evidently won't be making its own," Kotaku reports. Mad Catz revealed a games controller at CES Unveiled, a preview event before the main CES. The controller is said to use latency Bluetooth Smart v4.0 to connect to mobile devices. No information on release date or price has been announced yet but iOS 7 is expected later this year. Other features of iOS 7 include new user interface, a control centre, full-screen interface Safari, and multi-tasking across all apps. See our ten things you need to know about iOS 7 here.